Are you worried about dark spots that have started showing up on your skin? Have you recently noticed your skin getting discolored? That's mainly due to hyper-pigmentation or skin blemishes. You experience this situation mainly due to whiteheads or blackheads, or even acne. You may have to deal with blemishes at any age, but teenagers are the common victims because they experience quick hormonal changes in their body. These unsightly blemishes don't just affect your face, but they can appear anywhere on your body, including back, shoulders, and neck. Luckily, you can try certain home remedies for blemishes and make things better. In order to find the best blemish home remedies, you first need to figure what's causing blemishes in your case. 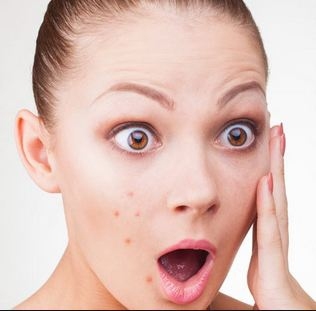 You need to understand that sebum and dead skin cells can clog your pores, and when this blockage is near the top layer of your skin, you see blackheads or whiteheads. Sometimes, deeper clogs can cause acne cysts and pimples that look red because of a bacterial infection. This may also lead to inflammation and pain. Therefore, you can also keep pustules, pimples, whiteheads, and blackheads in the category of blemishes originally caused by blocked pores. Many factors such as genetics, hormonal imbalance, poor diet, improper skin care, aging, and sun exposure may increase the risk of developing skin blemishes. Step 1: Use a mild cleansing soap to eliminate dirt and grease from your skin. Do it thrice at least, once in the morning, once at night and once before going to sleep. Step 2: Use a mild exfoliating scrub to get rid of impurities and dead skin cells that may clog the pores. Step 3: Skin toning is important, for which you can use an astringent or a toner. Use a moisturizer afterwards. Step 4: Use sunscreen lotion before you go into the sun. Step 5: Use lacto calamine lotion before you go to bed. It helps by absorbing excessive oil from your skin and reduces the appearance of blemishes. You can easily find blemish removal lotions and creams in the market today, but you will always be better off using natural remedies for blemishes. Lemon juice is an outstanding skin-lightening remedy and works amazingly well to reduce hyper-pigmentation and dark spots on your skin. It also has citric acid that removes excess oil from your skin and exfoliates it to get rid of dead skin cells. How to Apply: Get a lemon, cut it in half and apply its juice on your skin. Leave it for about 15 minutes and rinse off with water. Try it every day for a month at least. The presence of starch makes potato a good remedy for blemishes. It reduces pigmentation and is especially useful for dark circles under your eyes. How to Apply: Take a small potato. Peel it and grate properly to extract its juice. Use a cheesecloth or fine sieve to get its juice. Now, apply it on your skin using a cotton ball. Don't rinse off for at least 20 minutes. Try daily for a month or so. Using aloe vera is a good idea because polysaccharides present in its gel promotes growth of skin cells. It also helps reduce and heal blemishes and scars. How to Apply: Take an aloe leaf and extract its gel. Apply it directly on your blemishes or your skin and wash it off when it dries out completely. Be sure to do it daily for a month or so. It acts as a natural bleaching agent, so it proves beneficial for blemishes and acne scars. You can also use it to reduce suntan. It contains vitamin C and antioxidants that bring a natural glow on your skin. How to Apply: Make a paste by mixing a teaspoon of plain yogurt, a teaspoon of organic honey, and a couple of teaspoons of orange peel powder. Apply it on your skin and rinse off after 15 minutes. Repeat thrice a week for positive results. Rich in alpha hydroxy acids, it can lighten blemishes and dark spots. It also reduces excess oil on your skin and maintains a balance in your skin's pH levels. How to Apply: Make a mixture by adding one part of organic apple cider vinegar to at least three parts of water. You can add more water if it looks strong. Apply it on the affected area using a cotton ball and wash it off after 15 minutes. Use thrice a day to see good result. Milk can play a role in soothing your irritated skin. The research suggests it can also tone down redness and reduces dark circles and blemishes. How to Apply: Take a tablespoon of low-fat milk and add it to a tablespoon of natural, raw honey. Mix it well and apply directly on your skin using a cotton pad. You need to add layers of this mixture, but be sure to add the next layer after the first layer has dried off completely. Leave this mask for at least 15 minutes and clear with the help of a washcloth. Don't forget to moisturize your skin after the treatment. Using banana or papaya may help with skin blemishes because they contain bromelain, papain and other enzymes as well as acids that reduces the presence of blemishes. Simply rub a banana or papaya peel over your skin and leave for 15 minutes. Wash it off with cool water. You can use rose hip oil to deal with the redness of blemishes. Apply it directly on your blemishes and leave for 15 minutes. Wash it off with cool water. Eat a balanced diet consisting of vegetables and fresh fruits. Also, add garlic and ginger to your diet because they are natural antibiotics and help prevent blemishes. Drink plenty of water because this keeps your system hydrated and facilitates the process of throwing toxins out of your body. Server responsed at: 04/20/2019 6:43 p.m.